Scientific partnerships between China and the UK are being strengthened with the establishment of a £12m center for plant science and microbiology spanning the two countries. Two research institutes affiliated to the Chinese Academy of Science (CAS) signed an agreement to jointly establish a Center of Excellence in Plant and Microbial Science with John Innes Centre (JIC) this Friday in London. The joint CAS /JIC Center will enhance research to support the agricultural technology and microbial genetics agendas of both countries. Scientists with the Institute of Genetics and Developmental Biology (IGDB) in Beijing and the Shanghai Institute of Plant Physiology and Ecology (SIPPE) will investigate challenges facing agriculture and human health. 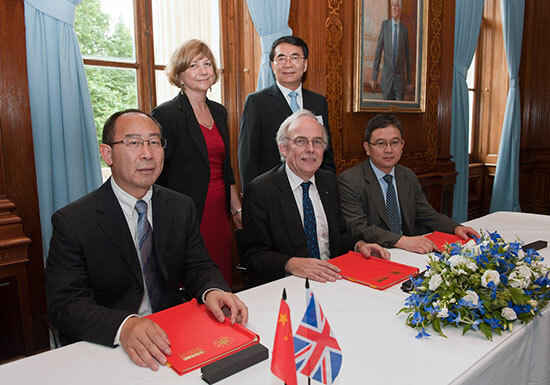 As “CAS’ first joint research center focusing on the studies of crop improvement and natural products”, CAS hopes to maximize their “scientific impact and produce top quality research, and further facilitate the international collaboration between Chinese and UK scientists,” said Dr. BAI Chunli, President of the CAS, at the signing ceremony. The agreement was developed with support from the two CAS institutes and the Biotechnology and Biological Sciences Research Council (BBSRC). IGDB and SIPPE will together contribute £9m over the five years. BBSRC will contribute £2m to the Centre, and JIC £1m during the same time period. Both Chinese and English researchers will join hands to focus on increasing crop yield and resistance to disease as well as developing the use of plants and microbes for the production of health-promoting natural products. This new agreement is the most advanced partnership between China and the UK of its kind. The strategic partnership with CAS institutes will establish ten new research groups in the new center in Beijing and Shanghai to work collaboratively with JIC researchers, according to Professor Dale Sanders, Director of JIC. The agreement was signed by Professor Sanders with Dr. YANG Weicai and Dr. WANG Chengshu, Deputy Director of SIPPE.